Antidiuretic hormone (ADH), also known as vasopressin, is a small peptide hormone which regulates the body’s retention of water. It is one of only two hormones secreted by the posterior pituitary gland in the brain. In this article, we will discuss the synthesis, release and action of ADH, and consider its clinical relevance. The synthesis of ADH occurs in the supraoptic and paraventricular nuclei in the hypothalamus. It is then transported to the posterior pituitary gland via the neurohypophysial capillaries. In the posterior pituitary gland, its synthesis is completed and it is stored here until it is ready to be released. Osmoreceptors in the hypothalamus regulate the amount of ADH released. Osmoreceptors are cells which are sensitive to the changes in the osmotic pressure of plasma. They are located in the organum vasculosum of the lamina terminalis (OVLT) and the subfornical organ (SFO). The OVLT is anterior and ventral to the third ventricle and has a fenestrated leaky epithelium to expose it directly to the systemic circulation. The release of ADH is controlled by a negative feedback loop. The osmotic pressure is dependent on the plasma osmolality. The plasma osmolality in turn is determined by the total body plasma volume. So if there is a fall in total body volume then the osmolality of the plasma will rise as there will be an increase in the Na+ concentration in the plasma. As a consequence, water will move down its concentration gradient from all cells to plasma. This stimulates the osmoreceptors cells, to contract. As a result, afferent signals are sent from the hypothalamus to the posterior pituitary gland to increase the release of ADH. Alternatively, if there is an increase in the total body volume then the osmolality of the plasma will fall. This is due to the decrease in the Na+ concentration in the plasma. In this situation, water will move down its concentration gradient from the plasma, into osmoreceptor cells, causing them to expand. As a result, afferent signals are sent from the hypothalamus to the posterior pituitary gland to decrease the release of ADH. ADH acts in the kidney to regulate the volume and osmolarity of the urine. Specifically, it acts in the distal convoluted tubule (DCT) and collecting ducts (CT) cells. Let’s consider an example where there is an increase in osmolality of the plasma. The increase in ADH release will mean that the permeability of the DCT and CT cells to water increases and urine output decreases. This happens because ADH increases the transcription and insertion of Aquaporin–2 channels to the apical membrane of the DCT and CT cells. This allows water to move down its concentration gradient, out of the nephron and back into the blood stream. This increases the water reabsorbed from the urine, in order to decrease plasma osmolality and increase total blood volume. Water reabsorption in this manner is a passive process. Alternatively, when there is a decrease in osmolality of the plasma then ADH release is inhibited. This results in a decrease in the number of Aquaporin-2 channels being inserted into the apical membrane of the DCT and CT cells. Therefore there is a reduction in the amount of water reabsorbed from the nephron back in the blood stream. ADH can also act on the blood vessels to increase peripheral vascular resistance in order to increase blood pressure. This mechanism is useful in restoring blood pressure during hypovolemic shock. Cranial diabetes insipidus – occurs due to a lack of secretion of ADH from the posterior pituitary gland. This could be idiopathic, or possibly due to damage to the pituitary gland by tumours, infection or trauma. It is treated with ADH analogues. Nephrogenic diabetes insipidus – there is no impairment in the release of ADH from the pituitary gland. 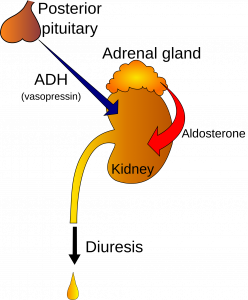 However, the kidney is unable to respond to the ADH and remove water from the urine. Initially, the condition is treated with amiloride. Where is ADH secreted from? Where are osmoreceptors located in the brain? Where does ADH exert its effect? Which channel does ADH increase the number of? How will an increase of ADH impact sodium concentration?